Mozilla Tech Speakers are talented, trained technical speakers who present at conferences, organize workshops and trainings, and mentor others on technologies driving the open web. The global Mozilla Tech Speaker program is designed to recognize, promote and develop the talents of volunteer technical advocates and educators who are interested in informing others about the open web and Mozilla products and technologies at events around the world. Tech Speakers receive support from Mozilla in the form of speaking opportunities, public speaking training, briefings and technical training, and funding for their activities. Are you looking for Mozilla to sponsor your event? The Tech Speaker Program is not what you are looking for, but we have a sponsorship program where you can apply for a grant. to advance the open web, with help from Mozilla. Create a strong community-driven technical speaker development program, with a global posse of talented tech speakers working together to advance the open web, with help from Mozilla. We offer a comprehensive curriculum that includes professional coaching and peer evaluation. We organize technical briefings and workshops conducted by industry experts. We support speaker participation in regional and global events. We connect Tech Speakers with conference organizers looking for Mozilla speakers and assist our speakers in their proposal submissions. We foster a community of individuals interested in technologies and public speaking. As a cohort, tech speakers assist each other and share tips and info. 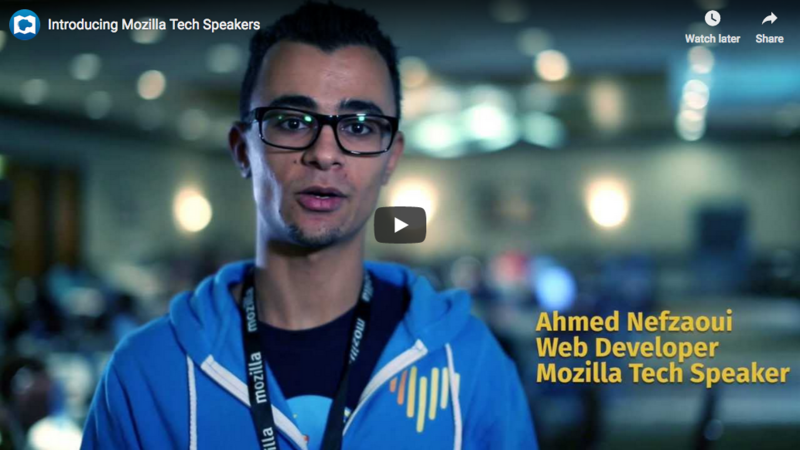 A brief presentation of the Mozilla Tech Speaker program and what it brings to its participants. Most of our Tech Speakers already serve in their communities as technical evangelists and educators before they join the program. Many, but not all, also contribute to Mozilla. All support the open web. Apply via our open-application process, which is held annually. Follow @MozillaTechSpeakers on Twitter or the Speaking category on Discourse for the latest information on timing for the application process. Applications for the next cohort are currently closed. Be nominated as a Tech Speaker by an active participant in the program in good standing or by an industry expert at Mozilla. This process is ad hoc and requires the completion of an evaluation process, including videos of past talks and an assessment interview with an internal expert. People who join the program this way are generally already being invited to large regional or global conferences and wish to affiliate themselves with Mozilla.